Dr. Cornelia Griggs, a chief resident in general surgery at Mass. General Hospital, has a 2-year-old daughter and is pregnant with her second child. Women training to become surgeons face daunting challenges juggling their work with the demands of pregnancy and motherhood, according to a new survey published Wednesday by researchers at Brigham and Women’s Hospital. Among women who had children during their surgical residency, 39 percent strongly considered leaving their training, according to the survey, which was published in the medical journal JAMA Surgery. And 29.5 percent of women surveyed would discourage female medical students from pursuing careers as surgeons because balancing pregnancy and motherhood with training is so difficult. The study sheds new light on a critical issue as employers in medicine and other fields consider how to attract top talent and diversify their workforces with more women. Surgery is a male-dominated medical specialty, though the gender gap has been narrowing. Nationwide, 36.5 percent of surgeons-in-training are women, according to the Accreditation Council for Graduate Medical Education — a smaller share than among residents of all medical specialties combined. Dr. Erika Rangel, the lead author of the study and a surgeon at Brigham and Women’s Hospital in Boston, said she was struck that so many women considered leaving surgery when they began having children. Training to become a surgeon is particularly grueling work. It takes five to nine years, with trainees working 80-hour weeks and spending many hours on end in the operating room without breaks. They work days and nights. The rigorous schedule can be especially difficult for women who are pregnant and have young families. Among women surgeons who responded to the survey, 95.6 percent said breast-feeding was important to them, and 58.1 percent stopped breast-feeding earlier than they wished because it was too challenging to keep up when they returned to work in the operating room. 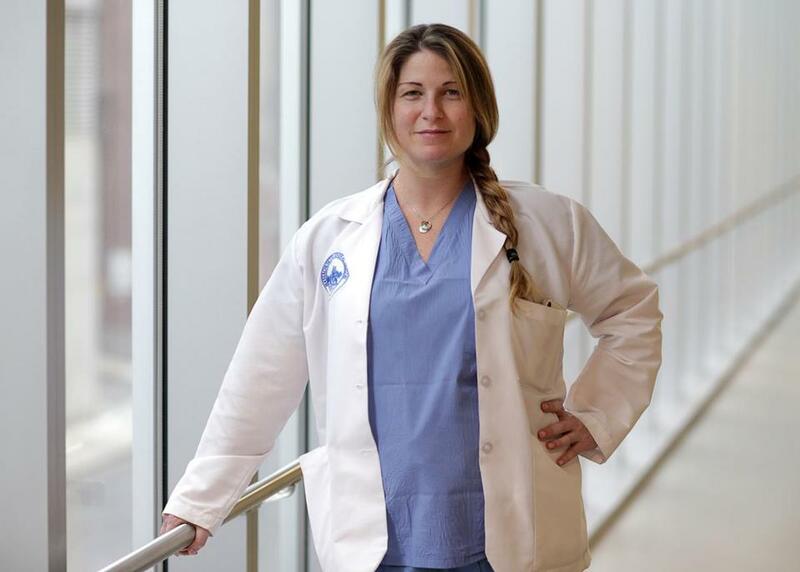 “There were definitely times when I questioned my career choice and whether it was even compatible with having an infant,” said Dr. Cornelia Griggs, a chief surgical resident at Massachusetts General Hospital. Griggs has a 2 1/2-year-old daughter and is expecting her second child in May. Before her daughter, Eloise, was born, Griggs worked until the day she went into labor, she said. When she came back to work, she struggled to find time for breast-feeding her baby while spending so many hours in the operating room. “I would forego any semblance of having a break in between cases and dash to the lactation room,” Griggs said. Most of the 347 women surgeons across the country who responded to the survey — 78.4 percent — said they took maternity leave of six weeks or less during their training. Seventy-two percent said they felt the leave was too short. Maternity leave for surgical residents is complicated by the fact that they must complete 48 weeks of clinical activity each year to finish training on time. But there are options to tweak that schedule. While surgery is a physically demanding profession, for many women the emotional challenges of balancing motherhood and career are even tougher. For example: when a mother has to leave her sick child with a spouse or another caretaker because she’s needed in the operating room. “One night my baby almost stopped breathing and was having an asthma attack,” recalled Dr. Sareh Parangi, an endocrine surgeon at Mass. General who did her training in the 1990s. Dr. Gerard Doherty, surgeon-in-chief at the Brigham, said the survey results show that hospitals need to do more to accommodate trainees who are pregnant or have young children, such as by scheduling enough people to cover for a resident who goes on leave. Surgeons said there are many ways hospitals can help residents as they start their families, including by offering more flexible maternity leave and work schedules, allowing breaks for surgeons who are breast-feeding, and setting up lactation facilities. Despite the challenges, surgeons said, it’s possible — and fulfilling — to juggle children and a career in surgery. “In any high-powered field, you’re going to question yourself all the way. You’re making these sacrifices,” said Dr. Jennifer Tseng, the chief of surgery at Boston Medical Center, who started her first job as a surgeon when she was five months pregnant. Several surgeons also said they see changing attitudes as more women pursue careers in the operating room. More female residents are having babies during training, instead of delaying until the end of residency. Priyanka Dayal McCluskey can be reached at priyanka.mccluskey@globe.com Follow her on Twitter @priyanka_dayal.